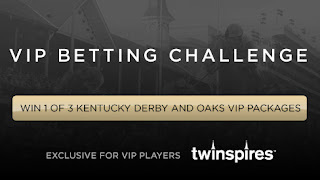 This contest is open to all TwinSpires.com account holders in good standing with a TSC Elite VIP status of Bronze or above as of March 30, 2013. TwinSpires.com account holders may achieve VIP Bronze status by wagering $25,000 in a calendar year. Contest players may compete for prizes by recording the highest Return on Investment (ROI) from all wagers placed on Gulfstream Park and Fair Grounds on Saturday, March 30. Once a player has placed the required $100 Win bets on the Florida Derby and Louisiana Derby, ALL of his or her wagers placed on Gulfstream Park and Fair Grounds on Saturday, March 30 will be considered entered in the contest. For Gulfstream Park, only wagers on races 1-13 will count in the contest. Races 14-15 are simulcasts from Chile and will not be counted in the contest. At the end of the day, all contests players will be ranked by their ROI on their combined wagers on Gulfstream Park and Fair Grounds. ROI is calculated by subtracting the total amount bet in contest wagers from winnings returned from contest wagers and dividing that sum by the total amount bet in contest wagers. Each Player’s ROI is then expressed as a percentage. For example, if a player bets $200 and wins $400 from those wagers, his or her ROI is 100%. $400 in winnings less $200 wagered equals $200, divided by $200 = 1 or 100%. Winners are responsible for making their own travel arrangements to and from Churchill Downs and accommodations in the Louisville area during the weekend of the Kentucky Derby. nice article, ill keep reading more off these wagering articles, it makes me want to go wager and win some money.